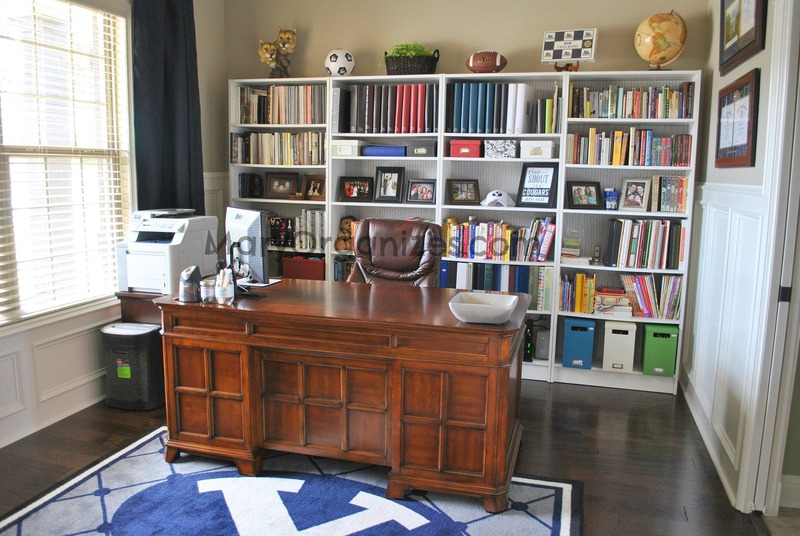 Last week the declutter challenge focused on our home office spaces. 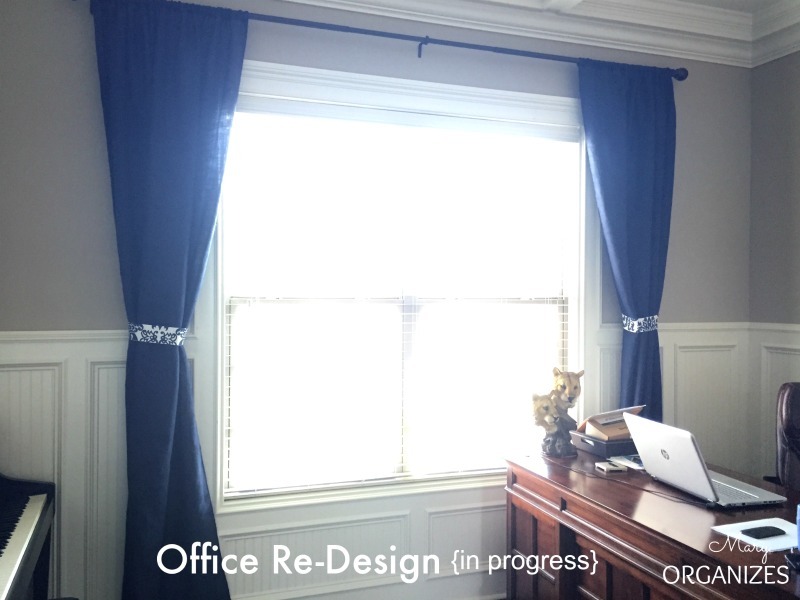 I took decluttering the office to the extreme. When we first moved in almost 4 years ago, I wanted shelves across the back wall to look like built-ins. That sounds really nice in theory, but in actuality, the shelves were giant dust and clutter magnets. My husband, Matt, starts a new job today. This is a huge deal for our family, because he had been with his last company for about 13 years! This new job is taking his career in a different direction, and I think it is going to be a great change for all of us, but especially him. 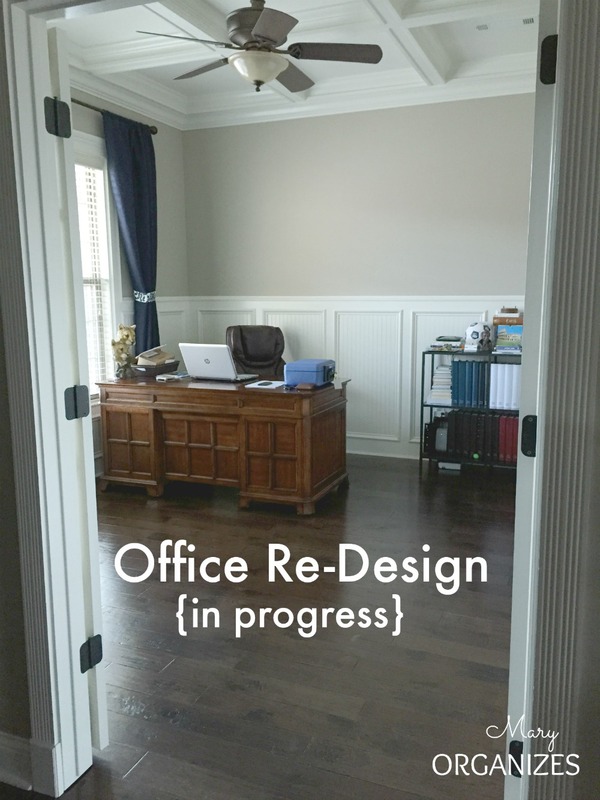 In his new role, he will be doing some of his work from home, so it seemed like the perfect time to gut the office and give it/him a fresh start. The shelves were nice and they have a new home at a friends’ house who was setting up a library area in her basement. The thing is, these shelves were the first thing anyone saw when they came into my house. It was a tough balance between wanting them to look nice, but storing things practically on the open shelves. There was so much on the shelves I wanted to get rid of, but then there would be empty shelves. 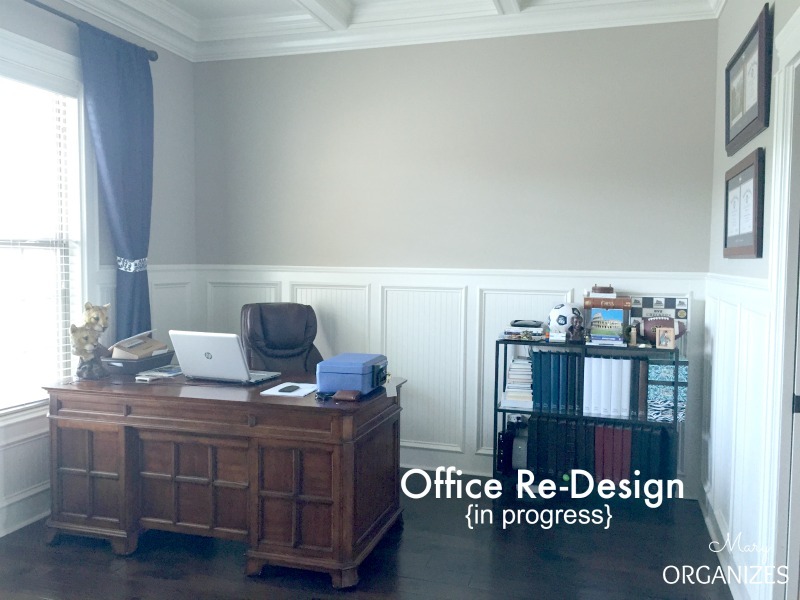 It was a constant catch-22, so I gave myself permission to rethink the office. Yeah, I felt silly re-doing it only a few years later, but as time goes on, I crave simplicity more and more. Removing the shelves made an huge difference immediately!! I moved the rug up to our family/media/playroom. Most of the shelf contents was donated, but what was kept got split up between our kids’ desk area upstairs and our under the stairs closet. It is true that I didn’t even clean off my husband’s desk for these pictures. He was in the middle of cleaning through the inside of his desk and I didn’t want to disturb his process or piles! It isn’t done by any means, but it feels good to be in progress towards what I want the room to become. I have so many ideas of how to make this room awesome. Already, the room feels so much bigger! This room is still the best one for the piano. 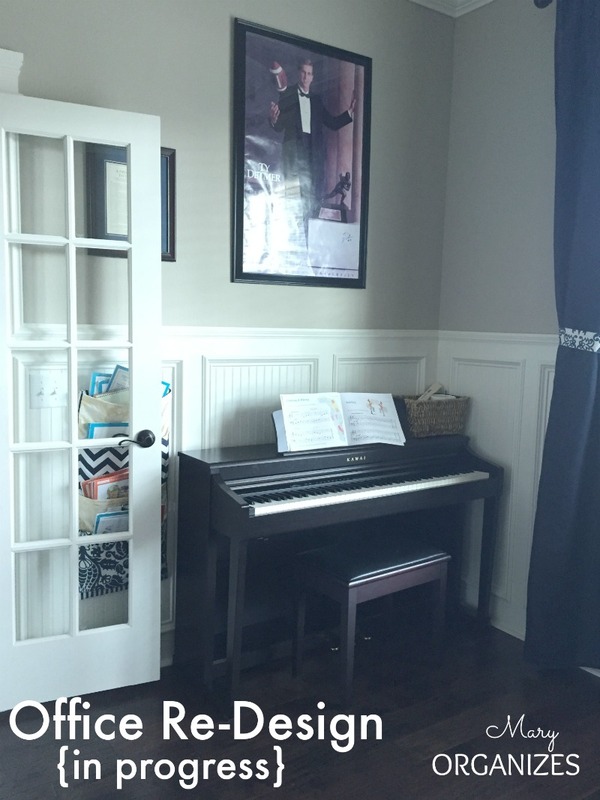 Things are constantly evolving around here, so it is possible that the piano could move to a different room as my kids outgrow some of the toys and things in the other places. My husband has had that poster for a long time. When we got married, he had moved it around so much and tacked it to the wall so much that it was pretty wrinkled and tattered. I had it framed for him one year as a gift. I’m not as heartless about decluttering as you might think, but I do always ask myself “is this item worth the maintenance to treat it properly?”. This poster was that sentimental/important to Matt. Decluttering is always the first step of organizing the right way. It can be the most difficult step of all and feels so rewarding to complete. I’ll be finishing the office over the next few months and will be sharing the additional steps of organizing in my first ever Summer Organizing Boot Camp Series coming up. I can’t wait!!! A new job!!! How exciting! Best wishes that everything goes well and he loves the new change! Thanks, Brooke! It is crazy, but we’re excited! I, too, thought I would love open shelving in my craft room/office but soon realized I preferred clean lines with a more professional appearance. I am closing off the shelving with white doors, labeling the doors with the contents behind them and my craft room looks so much better!! I started the process as recommended, clearing out the room, purging, labeling and organizing as I brought items back into the room. I am so much happier. That sounds awesome! I love the idea of adding cabinets to your shelves! I am going through this same dilemma now. We have a large built in that is filled to the brim with books and other small things. I have always wondered what it would look like with less on the shelves. I may experiment with this soon. I find I never regret the choice to simplify things!